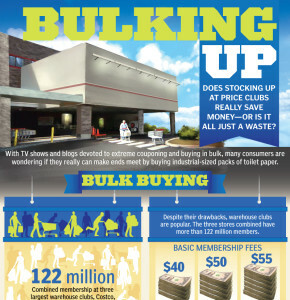 Does stocking up at price clubs really save money — or is it all just a waste? With TV shows and blogs devoted to extreme couponing and buying in bulk, many consumers are wondering if they really can make ends meet by buying industrial-sized packs of toilet paper. Despite their drawbacks, warehouse clubs are popular. Promotions can often be found at non-bulk stores with good deals toward the middle of the month. Unless splitting amongst a huge household, these items usually expire before they can be consumed. It degrades after six months, so unless you do a ton of bleaching, it’s not usually beneficial. It typically expires in six months compared to white rice – which can last up to 30 years. The shelf life is often six months to one year and unless you’re a makeup artist, it’ll probably go unused.